As Vice-President of the Canadian Federation of Independent Business (CFIB) which represents 1,600 small- and medium-sized employers (SMEs) in Halifax Regional Municipality (HRM), I would like to offer my input on an important decision with which you and other members of council are currently grappling. As you know, our organization communicates our members’ municipal concerns to you frequently via meetings, reports and appearances before council. We strive to provide background on the size and importance of the small business community across Nova Scotia and we share data which we collect through carefully controlled research procedures. Among the recommendations we have made on behalf of our membership, we have advocated for reducing municipal red tape, additional controls on municipal spending, the gap between residential and commercial property tax rates, mitigating the impact of construction projects and other issues which affect the bottom line of small and medium size businesses. Today I’m personally asking council to examine with diligence a proposal which may have significant and long term impact on the economic and cultural success of HRM. While CFIB has not undertaken direct research to determine the percentage of support among small businesses in the city, the overarching principles of support for small business guide my comments on this matter. In many ways, the donair is emblematic of our way forward in Nova Scotia. In its history it has incorporated elements of innovation, supported the success of our immigrant community and added value by providing employment and cultural benefits. Through the lens of the Ivany report, we can view the donair is both an asset and an opportunity. It is about Halifax as a community, it is about the courage to take a chance, our imagination and our determination to do better. The donair as an official food is a game changer that addresses the need for a city-wide commitment to growing the economy and the population. Since the early 1970’s, Halifax has been the epicentre of this growing culinary phenomenon. One important small business played a critical role in the establishment of the donair as a staple in the Haligonian diet. My first exposure to a donair was in 1977 when, as a student in broadcasting school, the donair was my primary source of sustenance for well over 8 months. 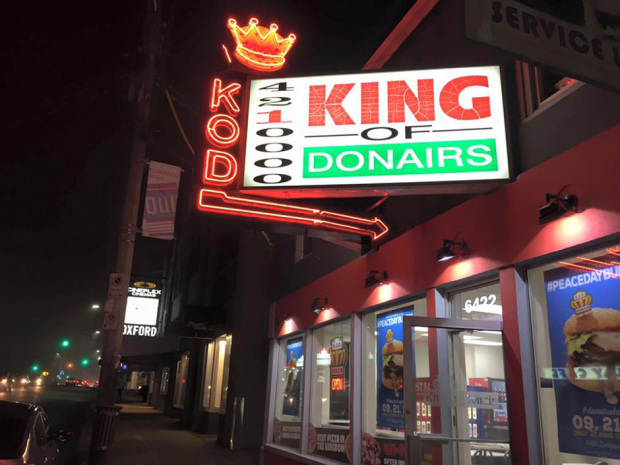 Every day before heading off to learn my trade, I would stop in at King of Donair on Quinpool Road and spend, as I recall under $3.00 for a single donair with hot peppers, parsley and a squeeze of lemon washed down by an ice cold Brio Chinotto. (Totally old school). How many others, like me, were convinced to stay here in Nova Scotia and help build the economy as the result of having access to a cultural and culinary resource unavailable at the time in other parts of the country? The Lebanese community has added a great many economic assets to our community and many of these were precipitated on the economic foundation provided by their culinary heritage. In recognition of their commitment and the commitment of all small business to the growth of our community and province, I provide my full support to the consideration of the donair as the official food of Halifax. Thanks for the letter Jordi-I have been posting about this subject for weeks! I have shared your letter on FB. How great is when you not only read the history above, but you also feel it and live it through Gus’ summer-time job in those early 70s. I always imagined how it was like back then for Peter… I wondered how hard he worked and how passionate he was in fine tuning his receipe for Halifax’s Modern Donair at Velos Pizza. He never stopped engineering the food until his concept of the donair would be a proven hit. -It is without a doubt that Canada’s Modern Donair was born here, on the peninsula, Halifax’s very own beefy delicacy. I’ve heard nothing but remarkable things about Peter’s history and I’m always hungry for more details (If any of his family/relatives/partners etc. Want to contact me). As per the open letter, Peter is a symbol of true immigrant success and today’s futur opportunity. An entrepreneur pouring out blood and sweat on no sleep. Thriving to do not just good, but great. He was a chef that changed the game here wether people want to understand that side of the donair saga or not. Enthused you wrote your note for the late Peter Gamoulakos, I wanted to add my piece as well, to commend him for humble service industry he’s helped create here, and to spread our story a little bit more on this side of the Maritimes. When I was sixteen, in 1976, and working at a gas station in Fairview, I went to a donair shop daily. It was owned by Niki and Taki, two enterprising gentlememen from Greece. Their donairs were heavenly! I remember being in the store and waiting forever to get my pair of donairs as a student preceding me ordered 100 donairs bound for Acadia. I wasn’t going anywhere! In my world, that was the epicentre of donairism. Many have followed, with varying degrees of success. Bash, Tony’s, and KOD had set the standard, and inexplicably, Bash disappeared. Others have had varying degrees of success. In my humble option, Big Slice, who has inherited Bash Toulaney’s digs on Duffus Street, is second to none. It’s fair to say, a dish only becomes iconic when locals claim it as exclusively ours. Invented here, as it were! Much like hot dogs belong to New York, and Philly Sanwhiches are decidedly Philledelphian, we own the donair. How great is it when you not only read the history above, but you also feel it and live it through Gus’ summer-time job in those early 70s? I always imagined how it was like back then for Peter… I wondered how hard he worked and how passionate he was in fine tuning his recipe for Halifax’s Modern Donair at Velos Pizza. He never stopped engineering the food until his concept of the donair would be a proven hit. -It is without a doubt that Canada’s Modern Donair was born here, on the peninsula, Halifax’s very own beefy delicacy! I’ve heard nothing but remarkable things about Peter’s history in my years and I’m always hungry for more details (if any of his family and relatives or partners would like to make contact… please do). Peter is that symbol of economic growth as per Jordi’s Open Letter. He’s that story of true immigrant success that brought many Halifax’s business owner’s an opportunistic market. An entrepreneur pouring out blood and sweat on no sleep. Thriving to do not just good, but great. He was a chef that changed the game here, weather people want to understand that side of the donair saga or not. Enthused that Gus T. wrote a nice note for the late Peter Gamoulakos on this subject, I also wanted to add my quick piece as well, to commend him for the humble service industry he’s helped create here, and to spread our story a little bout more on this side of the Maritimes.